About a month ago I discovered a new type of Bar Keepers Friend, one of the better all-around cleaners for stainless steel cookware and many other household cleaning tasks. 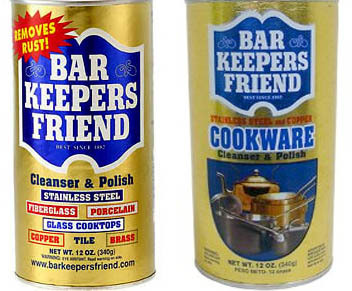 I wondered how Bar Keepers Friend cookware cleaner would compare to the regular version. Whether this is a recently introduced product, or I just havn’t noticed it before is a mystery to me, as the company that makes Bar Keepers Friend hasn’t returned my email about this. First let me say that Bar Keepers Friend is one of my favorite all-around cleaners for cookware, and if I had to choose only one cleaner to have around, it would definitely be Bar Keepers Friend. 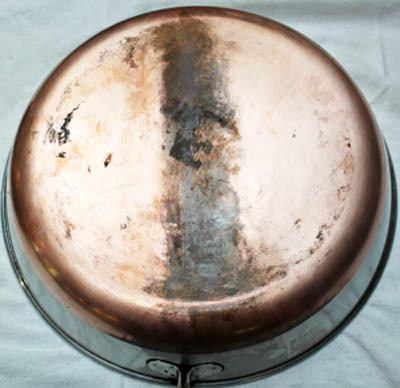 So it is with those high expectations that I compared the two cleaners side-by side on several pans with burned on grease, dulled and scratched stainless steel, and tarnished copper. First, I tried them on a couple of copper bottom skillets. The results are below, showing the regular version on the left and the cookware version on the right. In the middle is what the cooper part looked like before. I had trouble finding any difference between the results of the two. Note that the the above results are not exhaustive. I probably could have gotten almost all of the burned on grease and tarnish off had I done an exhaustive cleaning. 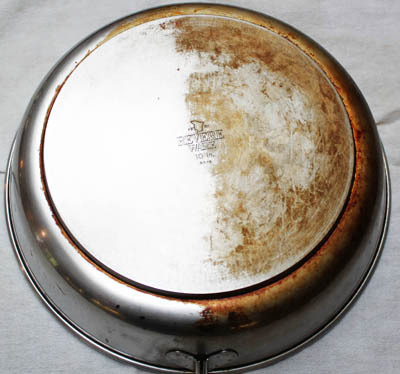 Below is a Revere Ware tri-ply skillet that had a particularly tough coating of cooked on grease on the bottom. The results are pretty impressive, as either version was able to cut through the grease with only a moderate application of scrubbing, although getting the corners and inner edges clean requires a bit more work. Seeing no difference between the two as far as I can tell, and given the slightly higher price of the cookware version (about 15% more), I would guess this is more of a marketing distinction than anything else. Overall, this product easily removes copper tarnish, burned on grease, heavier burned on food (with plenty of scrubbing), and does a pretty good job of bringing a nice shine to dulled stainless steel. Note that it won’t remove deep scratches, but I wouldn’t have expected that. I recommend sticking with the regular (cheaper version) of Bar Keepers Friend. Just follow the simple directions on the packaging and it might be a good idea to wear gloves when using it, as it is a bit hard on the hands.